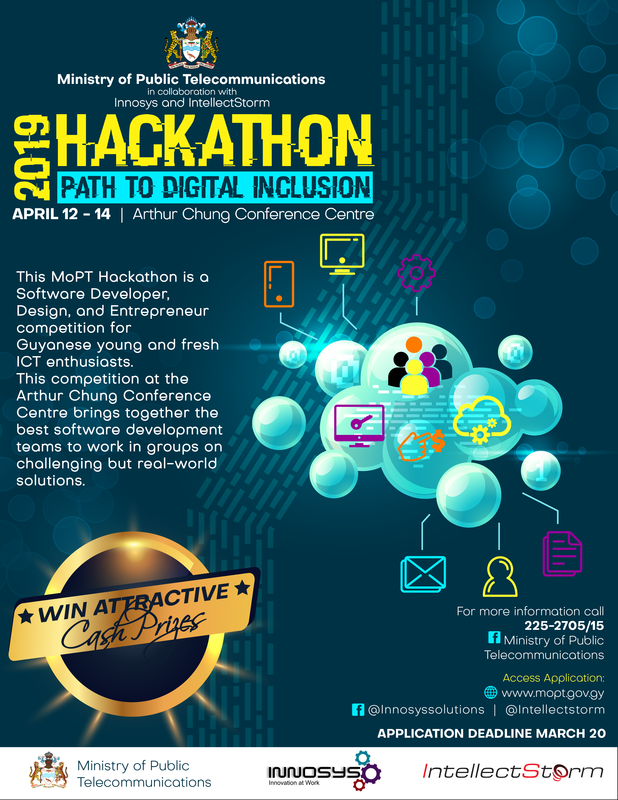 The Government of Guyana through the Ministry of Public Telecommunications has collaborated with Innosys and Intellect Storm to host Hackathon 2019, Path to Digital Inclusion. The Ministry continues to focus on the development of an ICT ready work force through initiatives which can create solutions to national issues and by extension create employment opportunities. As the Government continues to enhance Guyana’s technological capacity and infrastructure, the Ministry will continue to do its part to foster the use of ICT as a tool for national development, creativity, innovation. Participating teams must consist of 4 persons per team. Age range is 18-37. Each team must have one female member and one UG student. Teams must own the copyright or have expressed permission (in writing) to all pictures, sounds and assets used in the creation of the submission. All software used must be licensed copies. Participants accept liability for any copyright infringement. Teams must apply under a group name, and subsequently list the names, identify a team leader and details of the individuals within that group on the registration form. The Event organizers will not be responsible for the division of prizes among team members. Prizes will be handed over to the group leader as identified on the registration form. Complete authorization (signed) of all documents by taking part in the competition you warrant that all information submitted is true, current and complete at the time of submission. It is your sole responsibility to ensure that your details and email address are accurate, and that MoPT is informed of any changes to these. By participating in this Competition, the applicant agrees to release the MoPT, their sponsors, advertising and promotions agencies, parent companies, affiliates, subsidiaries, officers, directors, agents and employees, harmless from any and all liability whatsoever from any injuries, losses or damages of any kind arising from participating in or in connection with the Competition. The Submission should not contain material that violates or infringes another’s rights, including but not limited to privacy, publicity, copyright, trademark, patent or intellectual property or property related rights. The Submission must not contain material that promotes discrimination based on race, gender, religion, nationality, disability, sexual orientation or age. All members must participate. During the 48 hour period at least one member of each team must be present working on their solution. At no time can a full team take a break all at the same time during the competition. Food, Drinks, Caffeine and Energiser will be provided during the competition. The selection process will be administered by a highly qualified panel of Judges from Government, Private Sector and Academia. These judges will review team presentations with reference to judging criteria and determine, in its sole discretion, the winning teams by 1st, 2nd and 3rd places. Guaranteed to be challenging. Know you stuff!!! Have a good team. All applications must be submitted on or before March 20, 2019. Cash Prizes will be given to the teams placing 1st, 2nd and 3rd.